My first impulse is to apologize for the effusiveness of this page, though in my enthusiasm for the Fairmount Water Works Interpretive Center (FWWIC) I am hardly alone. For the record, I am a contract employee of the Philadelphia Water Department, which created the FWWIC, and I had some input into the material used in the historical exhibits, so consider my biases if you must. But the fact remains that the FWWIC is one of the most exciting and dynamic historical sites in the city today. Opened in 2003, the site serves a number of constituencies equally well: educating the historically-minded with beautifully illustrated panels and clear text describing the development of the nation's first public water supply in Philadelphia; describing for those with an engineering bent how the various pumps used in the works actually worked; and engaging the general public and especially school-age children in issues of water pollution and watershed preservation. The bottom line is that a visit to the FWWIC is delightful for people of all ages and backgrounds--and it doesn't hurt that admission is free. For hours and other information, visit http://fairmountwaterworks.com. One reason the FWWIC works so well for so many people is because of the wonderful exhibit panels, created by the graphic artists at Steve Feldman Design, a Philadelphia design firm. 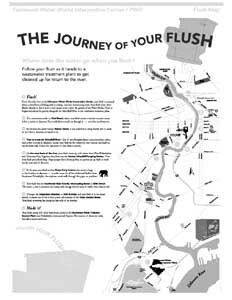 If I had to pick a favorite panel, it would be the colorful map charting "The Journey of Your Flush," mounted inside both the site's restrooms. (Click on the black and white thumbnail version at the left to download the color PDF version (877 kb). Katy Blander, of Steve Feldman Design, used input from many PWD staff people to create this flush map, which is as beautiful and fun and (dare I say?) tasteful as any such thing could hope to be. I could go on and on in my praise, but my main hope is that this inspires you to visit the Fairmount Water Works Interpretive Center. When you do, email me with your comments, and I'll incorporate them into future versions of this page.